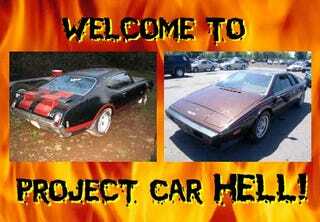 Project Car Hell: Toasted Esprit or Hacked 442? Project Car Hell: Fairlane Wagon or Volvo Bertone? Hot damn, a Lotus Esprit S2 for under five grand? Yes, folks, that's no typo! You hand the gentleman $4950 and you leave with a genuine 1979 Lotus Esprit S2 boasting a mere 35,000 miles on the clock. You'll note we didn't say you'll drive away in an Esprit, because there's the little matter of some fire damage; the seller doesn't go into great detail on the subject, but the engine compartment area looks awfully scorched. If you're willing to throw in another $2900, however, the seller promises to repair it... though the definition of "repair" is, how shall we say, not spelled out here. But come on, it's a Lotus Esprit! A 140-horse 4-banger was sheer lunacy in '79, and just look at how beautiful it is! We'll be the first to admit that this car doesn't look so strong in the parts availability, reliability, and ease-of-repair departments, but... well, that's where the "Hell" part of Project Car Hell comes in! Who among us doesn't want a big Detroit musclecar from the Golden Age of the breed? Yes, a midsize coupe with great big rumbly engine and unapologetically flashy trim, a car that exudes confidence and optimism! The GM A-body musclecars of the late 60s are especially good, with their 4-link rear suspensions and mean-looking lines, but who can afford a genuine GTO, big-block Chevelle, GS, or 442? Well, if you're willing to dive into the glowing, lava-spewing entrance to Project Car Hell, you can! Howzabout a '69 Olds 442 for the you-must-be-dreaming righteous price of $3500? Where's the catch, you ask? Well, it doesn't run... but you probably figured that, and anyway the original 400 has been replaced by a 350. No problem for a wrenchmeister of your caliber! But, see, there's the "targa roof" the seller has installed. Yes, you read that correctly: this 442 has been modified with a "custom removable Targa top, fabricated using factory convertible components." Oh, and there's rust. And the interior's trashed. Don't let that scare you, though- all you need to do is weld the roof back together, build a 400 or 455, fix all the rust, and.... well, actually you should let that scare you.